Micronutrient powders (also known as MNPs) are conveniently packaged, powdered vitamins and minerals that can be added directly to food. MNPs are inexpensive to transport, safe to store without refrigeration, and easy to use. MNPs were first developed by Dr. Stanley Zlotkin in 1997 at the Hospital for Sick Children in Toronto, Canada, in response to a United Nations Children’s Fund (UNICEF) led challenge to find new solutions to micronutrient deficiencies that could benefit children worldwide. In 2011, a Cochrane Review was conducted to assess the effects and safety of home-fortification of foods with multiple micronutrient powders on the nutritional outcomes in children under two years of age. The study concluded that multiple micronutrient powders is an effective intervention to reduce anaemia and iron deficiency in children six to 23 months of age. Subsequently, the World Health Organization published guidelines recommending the use of micronutrient powders to reduce iron deficiency and anemia among infants aged 6 to 23 months in areas where anemia is a problem. The Home Fortification Technical Advisory Group (HF-TAG) - a community of stakeholders involved in home fortification - recommends that sachets should be made available throughout the year for vulnerable groups with a target of providing an additional 50% RNI/d for each micronutrient. NCP's Dr Ema Parian and nutritionist Beia Mendoza talk about the use of micronutrient powders (MNP) to reduce anemia in GIDA barangays (Geographically Isolated and Disadvantaged Areas), in the Philippines. With up to 50% of Filipino infants suffering anemia, NCP was determined the Philippines should have the capacity to produce its own micronutrient powder. In 2015, NCP provided 23 metric tons of MNP to the Philippine Department of Health, as part of their micronutrient powder program. The program has the potential to reach up to 385,000 children. NCP has two kinds of micronutrient powders; Nutri-Foods MNP and Vita Meena MNP. Nutri-Foods MNP contains 15 essential vitamins and minerals, providing 100% of an infant's Recommended Nutrient Intake (RNI) in single-serve 1 g sachet. We recommend 60 sachets are given over six months, consistent with the Philippine Department of Health (DOH) recommendations. Vita Meena MNP contains 22 micronutrients, and is now available in Cebu Province at Three Sixty Pharmacy. We have conducted both sensory evaluation tests and stability trials (funded by the Global Alliance for Improved Nutrition) to ensure that our MNPs are suitable for use in the Philippines. Our MNPs are approved by the Food and Drug Administration (FDA), and we encourage the use of MNP at national and provincial level. 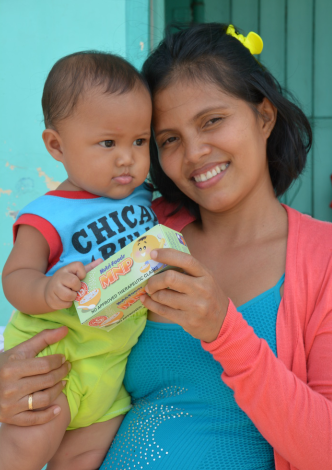 Mother and child hold a box of Nutri-Foods MNP, at an NCP nutrition information and distribution session, Cebu, 2015. 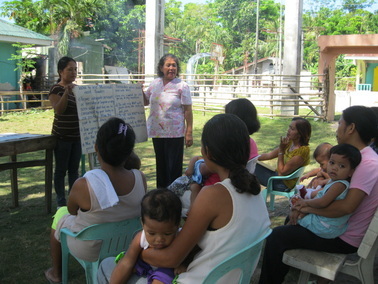 A barangay health worker councils mothers on the use and benefits of MNP, in Villahermosa, Tudela. Micronutrient powders were distributed to over 2000 infants in two municipalities during the immediate rehabilitation period after Typhoon Haiyan (known in the Philippines as Typhoon Yolanda). NCP ran information sessions at local health centers, orienting the local midwives on the proper use of micronutrient powders for home use. The midwives then ran similar workshops for the mothers in the community with infants 6 to 23 months old, demonstrating the use of MNP in complementary feeding. Our subsidiary, the Philippine Nutri-Foods Corporation, continues to produce and distribute an MNP - containing 15 vitamins and minerals - to geographically isolated and disadvantaged communities. NCP also provides the Philippine Department of Health with same quality MNP under their preferred brand name of Vita-Mix. Our 15 vitamin and mineral MNP provides 100% of the Recommended Nutrient Intake (RNI) of infants aged 6 to 23 months. In 2012, NCP conducted a usability study of MNP amongst mothers in low socio-economic areas. Two hundred mothers were recruited from the "D" socio-economic class in Metro Manila. The "D" socio-economic strata accounts for nearly 60% of the Philippine population. We provided micronutrient powders for 7 days and monitored the mother's usage, acceptability, and perceived benefits of MNP. Most mothers gave their child MNPs for 6 to 7 days, usually with the breakfast meal. Very few divided the MNPs into two servings. The study showed acceptability was high and mothers reported that their children had increased appetite and activity. The study was funded by the Global Alliance for Improved Nutrition (GAIN). 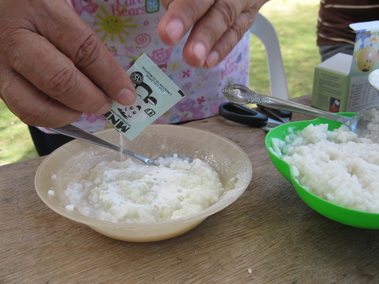 A barangay health worker demonstrates how to mix MNP into an infant's cereal or rice.